All lovers of the Gita will give especial credits to Prof, F.O. Schrader of Kiel university (Germany), for his having two commentaries thereon, belonging to the 10th century. 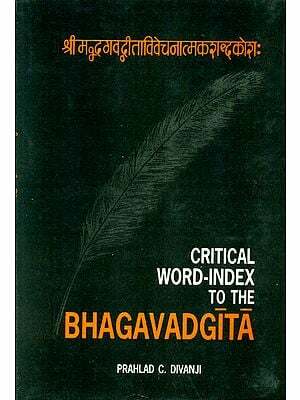 The importance of this find will be rightly appreciated when we remember that for centuries past the belief was that the text of the gita continues as it was commented upon by Samkara in the 7th century and baring a few ordinary cases there were no variant readings in the whole text. 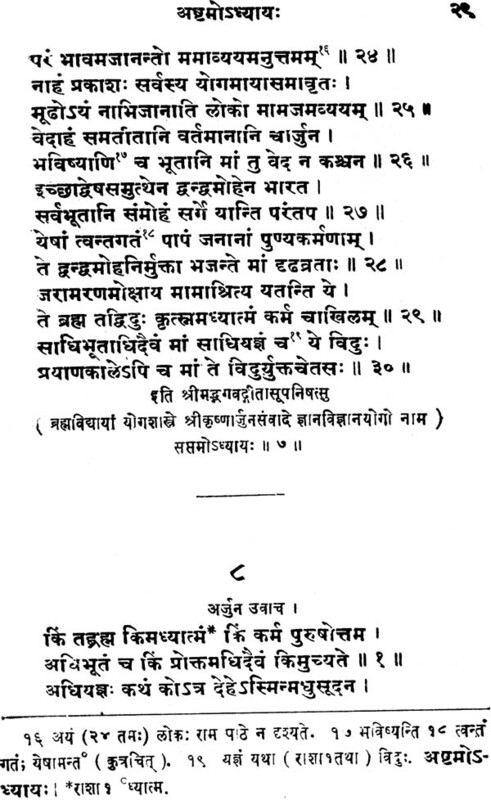 This point has been among others discussed by the Late Lokamanya Tilak as also by Prof. Edgertaon variant reading in the manuscripts the latter scholar asserts at 99 of his Bhagvadgita are virtually nonexistent. There is absolutely no documentary evidence that any other form of Gita than that which we have was ever known in India. 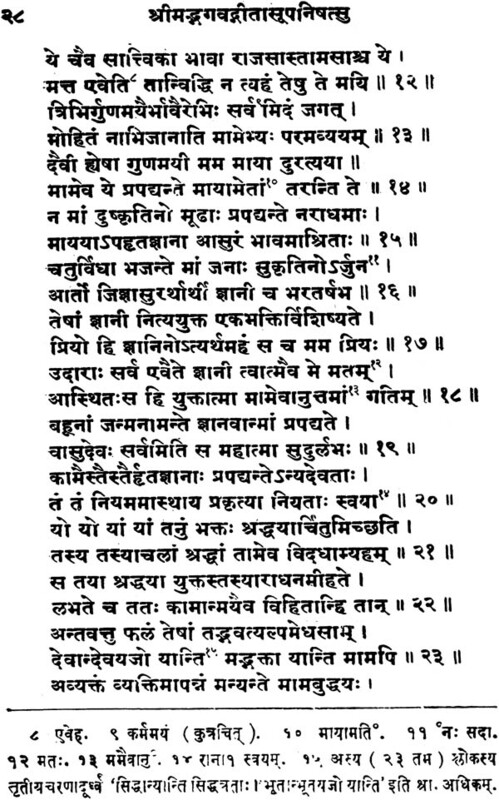 The former too in his Gita Rahasya argues in the same strain: an enumeration of the total stanzas in Gita occurring in one of the subsequent Adhyayasof Bhismaparvan (43. 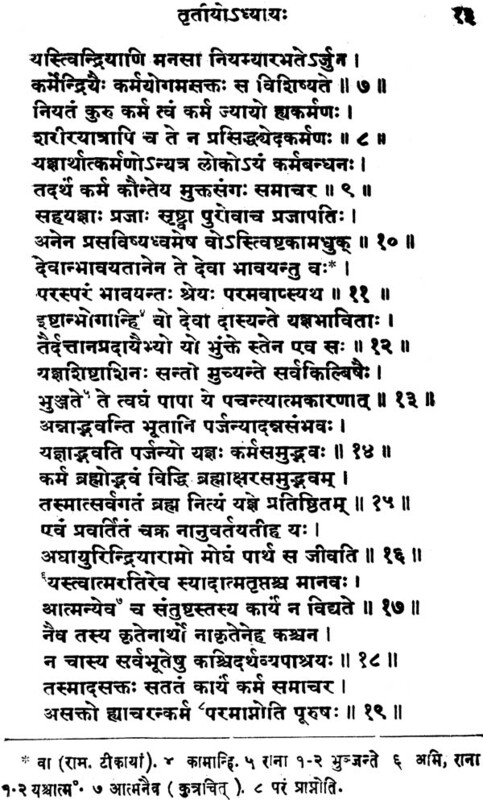 3-5 lines which according t Nilakantha are missing in Gauda version) led this learned exponent of Karma doctrine to take up the question of the text of the Gita. 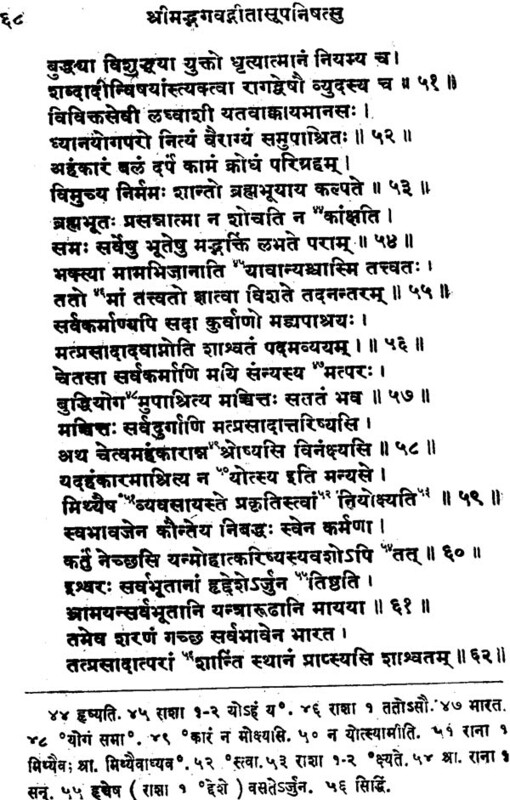 The enumeration found in some printed editions of the Mbh., gives the total number of stanzas in Gita as 745; while the current text runs over 700. Or, including the one at the beginning of the 13th adh., 701 stanzas only. 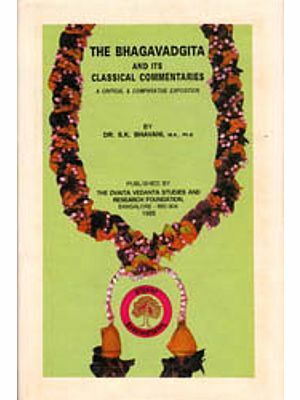 The suddha Dharma Mandala of Madras had already published their particular version of Gita of 745 st and 26 ahd., stating that the text was also accompanied by a Bhasya by Hamsayogin a sage of the 5th cent; but somehow it was not taken into consideration and the argument that the current text of 700 st. was the only reliable one was and has been so far a belief accepted by all. Lok. Tilak contends that on account of its exceptional popularity the text was for centuries past orally recited by millions and the tradition has come down intact barring a few insignificant differences. 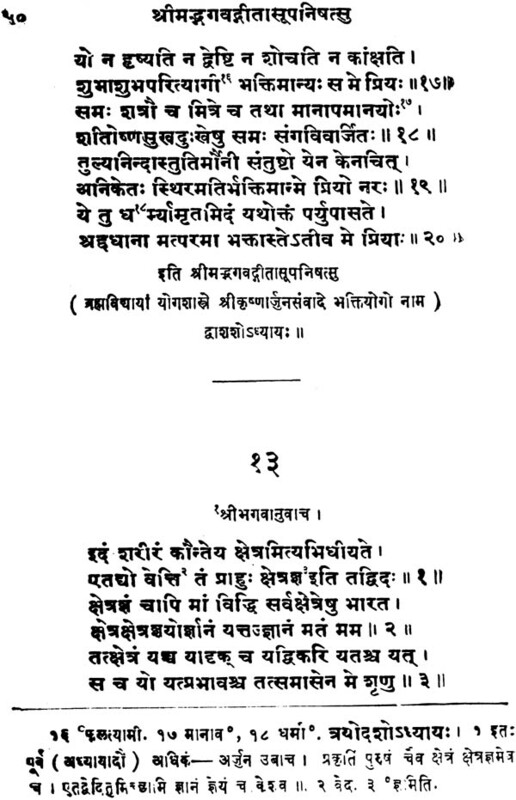 Prof. Schrader’s discovery of the Kasmiri tradition coming as it does from a non sectarian scholar has now opened the question of the Gita text anew and although this Recension does not claim to have 745 st. so much the better this with its additional stanzas ad a large number of is not at least so intact as it is supposed to be. These different versions of the Gita text are further accompanied by commentaries a fact which go to show that the by commentaries a fact which would go to show that the particular version was in vogue in the particular part of the country where the commentator lived. I do not of course propose to plead that either of these versions is the original; on the contrary I would urge that this small text too was for a time subjected to a handling from different persons just like its mother the Mahabharata. Recent study of old Mbh. Mss. At the Bhandarkar institute has shown that the text of the epic was different and this work of these scholars has given rise to different extent versions of the epic. Dr. V.S. 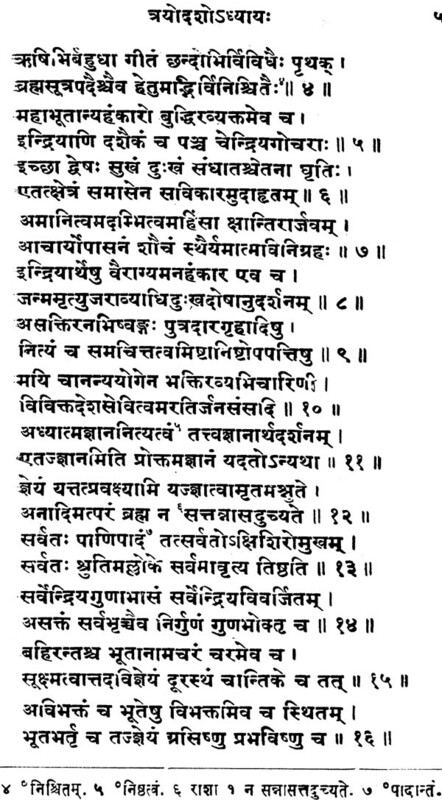 sukthankar in his review of Schrader Gita says and with perfect reason too who would have the temerity to cut out 14 original stanzas belonging to the glorious song of the Blessed Lord? Stanzas could get added original or not the version is there supported by its commentaries and thus the necessity o a critical edition of the Gita text for the comparative study of all. The existence of a Gita text of 745 stanzas has been further warranted by two important references: one and this is the stronger of the two is brought to light by Prof. Mahesh Prasad of the Hindu university Benaras. Her has seen a Persian manuscript containing the translation of the Gita by Abu Fazal the famous Sanskrit scholar at the court of akabar the Mogul emperor. Fazal Sates in his introductory remarks that the has translated from the Gita containing 745 stanzas! 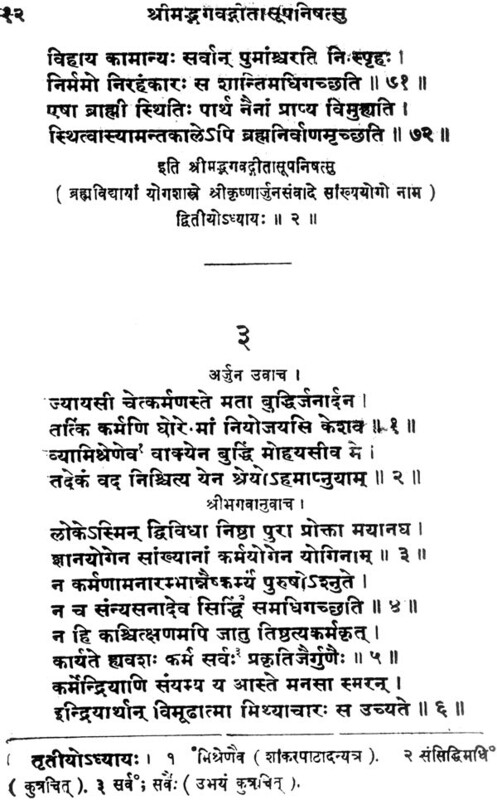 It would be well if the learned Professor brings out a printed edition of this manuscript before the public as in the absence of an original Sanskrit text the translation would give the student an idea of what the original was like. Another reference is by Kesava Kasmirin of the Nimbarka school of philosophy who at the beginning of the his com. 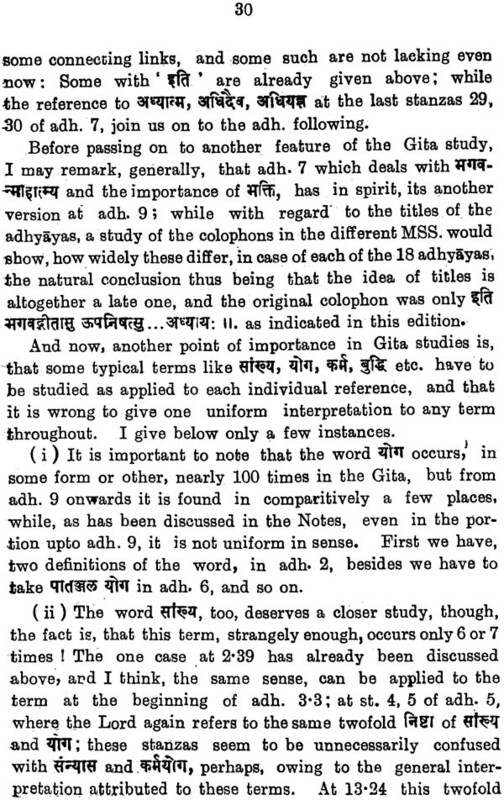 This is how Prof. Schrader, rather accidently, came across the Kas’miri recension of the Gita: when engaged in the study of Abhinavagupta works I found to my surprise that his is not based on the common Indian version (vulgate) of the Bhagavadgita but on a peculiar Kas;mirian recension of the same existence of which had in spite of the publication of the same com. As long ago as 1912 by the well known Nirnaya Sagar Press, escaped attention because of the misleading way in which the work has been published looking round for a fuller Gita Com. Based on kas’mir Recen., saw that one at least was available viz. the of Ramakantha all the remaining Mss were found to contain the vulgate only it seems to me to be evident from this that owing to the intrusion of the vulgate into Kasmir the Kasmirian recension of the Gita must have fallen into disuse at the time of the extinction of the School say in the 14th century. Of these tow commentators Abhinavagupta has written rather a short com. And would not much help the finding of the text; but the other Rama. Has an exhaustive com. And besides quotes all the stanzas of the text before writing upon them. The first adh. However as ignored by this Rama but fortunately Prof. Schrader found an old birch bark Ms. Of the Gita text preserved in the British museum. This Ms. is written in sarada characters and would have been an additional means of help. It was however found to be fragmentary breaking off at the beginning of the differences in this Mss. Have been noted and they are especially useful as stated above for the first adh where both the commentators are silent. And it is here that I come in. curiosity to find out more material led me to a search in the Govt. Mss. Library at the Bhandarkar Institute and I found the following Mss. Of Abh. Com. An examination of the variants given at the foot of the text will show that my efforts have not been in vain. I further examined some nagari Mss. Also of tba Gita text and found occasional variants which I have noted as occurring elsewhere Variants without any prefix should be taken as belonging to the Kas’miri tradition generally. I may add here for a correct understanding of all concerned that my present efforts do not claim to bring out a critical edition of the gita text in the strictest scholarly sense of the term. It is now well known well that the Bhandarkar institute is bringing out a critical edition of the whole Mbh. 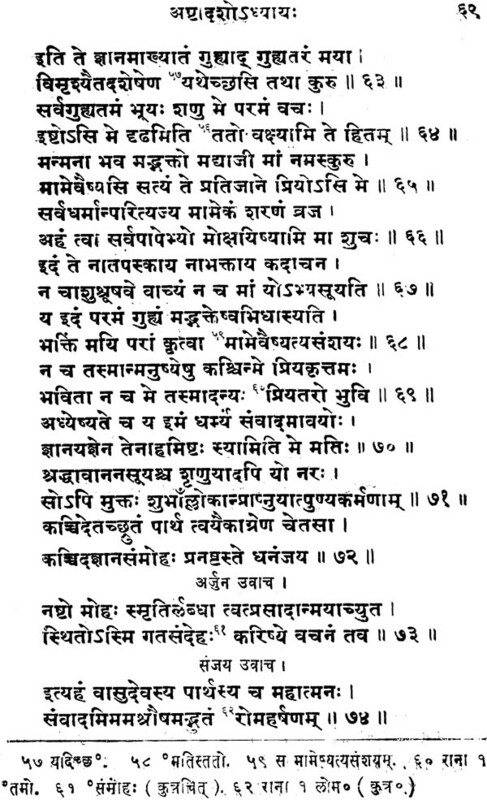 And the Gita too would appear in this edition in due course when a scientific classification of the different Mss. Will be presented with the critical apparatus for the study of scholars and when too many things of importance such as the valuable collations of the rare Saradha Mss. In the collection of the Asiatic of Bengal collations which to say the least further confirm Prof. shcrader representation of the Kasmiri version would in full detail be available. The present work is only a modest effort more for the benefit of a general student that of a regular scholar specializing in epic studies. 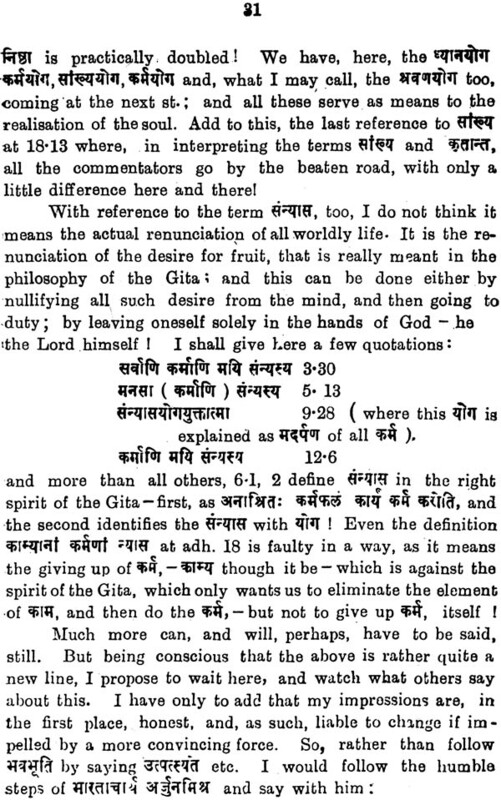 Regarding the additional stanzas and numberless variants in the Kasmiri text the Gita Prof. Schrader says: I do think that some at least of the additional matter of Kas compared with V (current text) may have been in the original Gita before the number of its stanzas was cut down to seven hundred…. We have seen above what Dr. Sukshankar and his intensive study of the Mbh text problems from original Mss given his opinion great value says about this text being cut down prof. Barnett too does not accept Schrader thesis its tradition has been not a little warped by editorial emendations and possibly also by some interpolations; whether in spite of these changes it is nearer to the original Gita is still not clear. So leaving aside the two extreme views the one that the present text of 700 is the original and intact a belief generally entertained and the other. That either the Kasmiri or Hamsa Yogin version was the original we may safely follow the middle path and assert that the Gita exists in more recensions than one and the fact is further strengthened by the existence of commentaries on the different versions.